The MW 10 extra sharp point will quickly and consistently pierce into 20 to 29 gauge steel sheeting and then into wood without slipping or damaging the panel. The MW 10 is available in lengths from 3/4″ to 3″” and is available with DB’s MAG life coating. 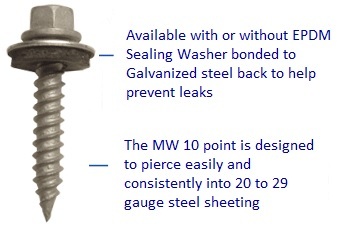 Click here for technical information on our MW 10 fasteners.